It has been a while since there has been a post on this blog; six months to be precise. But that does not, automatically mean, we haven’t posted anything. We have been busy with a new blog, slightly more thematic, topical in nature, and massive in purpose; introducing, The Custodians. As is probably obvious, The Custodians looks to being a primary resource of historical and cultural information and knowledge of the Indian Subcontinent. We will keep up academic rigour, yet, create a simple and engaging material, and be true story-tellers. Apart from creating original work from our contributors, we are also developing a large repository of open source material and links to interesting articles and other sites. We know that the journey is long and it is hard, and we cannot do justice by ourselves. So we are inviting like-minded people to join us in this journey, and contribute to this initiative. We welcome different types of contributions, so do have a look, and let us know if you could also become a Custodian. In the meanwhile, if you have liked His Story Telling, we think you will enjoy this new initiative; please follow, The Custodians. Here’s the Blog and it’s feed. We are also on Twitter and Facebook. Thank you, and looking forward to your visits at The Custodians! PS: The His Story Telling blog will remain live and we may have occasional posts, on themes and topics outside of what we post on The Custodians. One of the primary sources of gleaning the life, styles, and lifestyles of historical figures is through art. Art achieved great heights during the Mughal patronage and continued to flourish under Jaipur and Deccan patronage. After the decline of the Mughal empire, artists sought patronage in Rajasthan and in the Deccan. It is generally assumed Aurangzeb is responsible for the decline of the arts in the Mughal dominions. Yet, there is evidence that it was not always so, and he moved away from arts at a later stage in his life. The migration of artists was not just a result of their quest for favourable patronage, it was also political. An artist was a part of the loot of the war and ended up moving to serve a new master, in a new region, in a new culture. This led the blending of various styles, a coming together of schools, so-to-speak. The decline of the Mughal Empire led to the migration of artists to the Deccan, where they would receive patronage to continue their work. However, we see little development of visual art (specifically, painting), during this period, in Maharashtra and specifically in Western Maharashtra, the seat of the Peshwas. The rule and reign of the Peshwa era, from the mid-1700s, was growing around the same time that the Mughal empire was in decline, so it would seem that the artists would make a beeline to this power centre too. Yet, it seems, that this did not happen. There are paintings of Maratha chieftains and others that were created during this period, but these were primarily created by artists from other dominions and schools of art. It is not until the later decades of the 1700s that we see some development in the painting discipline, by the Marathas. And this development had much to do with the contact of the Marathas with Rajasthan and European influences, than the natural transmigration of artists from the north or from the Deccan. If any significant advances were made (in the art of painting) in this region in the late-17th or the early-18th century, there is a serious lack of evidence, documentation, and research. Also, in this post, I refer specifically to Western Maharashtra, because a well-known school of painting was established by the Tanjore branch of the Marathas (1674 – 1855) to promote visual art. This is not to say that there was no development or evolution of art during the reign of the Marathas. Significant advances were made in performance art and “craft-related art” during this period, which perhaps, will be the subject of another post. Chh. Shivaji’s preoccupation was primarily with building an empire and his priorities therefore did not include patronage of art. During the establishment of the Maratha supremacy, in the early years, available resources were strategically invested in military affairs and the resurrection and establishment of a people-friendly and functional administrative system. It is no surprise then, that of the available contemporary portraits of Shivaji, not a single one has been painted by a Maratha artist. There is however, another argument that merits discussion. One of the purposes of the paintings in the Mughal Empire was documentation. We see glimpses of the lives, events, and the environment of the Mughal ethos in these paintings. And if documentation be the purpose, the Marathas were definitely not lacking. Visual documentation is cumbersome and time-consuming. 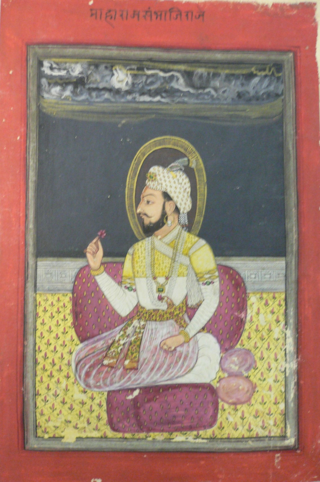 The Marathas chose prose over painting, in the form of Bakhars. The intrigues of the court were not merely political in nature, they were cultural too. Manuscripts in Maharashtra which were devoid of any illustration were now being worked on by artists from Rajasthan. 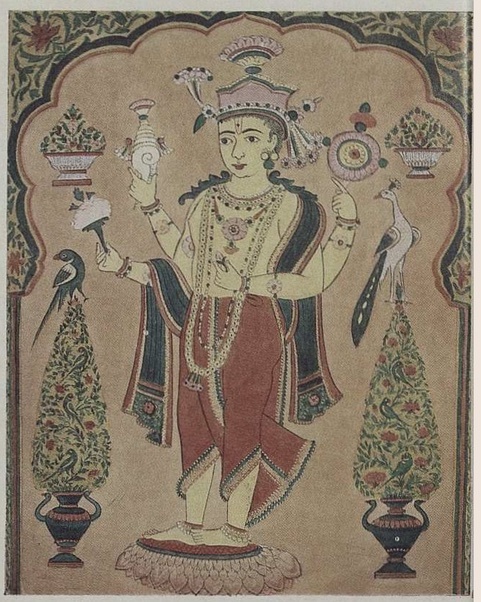 Miniatures in the Rajput and Pahari style were being created with religious motifs and symbolism. As we approach the late-1700s we see the European influence. Sir Charles Warre Malet was the first British Resident at the Peshwa’s court. he was instrumental in getting James Wales, the Scottish artist to Pune. Wales came to Pune in 1790 and created some of the iconic paintings of Sawai Madhavrao Peshwa, Nana Phadnavis, and MadhavRao Scindhia. It was during this time that Sir Malet suggested the establishment of a school of art, which Wales supervised. 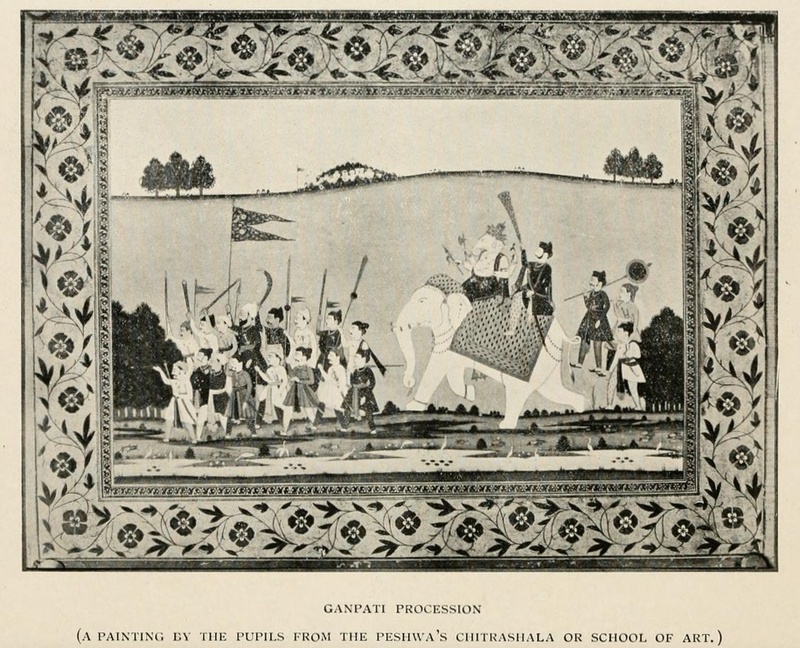 This is perhaps for the first time, we hear of any formal discipline for painting, in the history of the Marathas. We are aware of one graduate of this school, Gangaram Chintaman Tambat, whose works are still available to us. Undoubtedly, the work of this “Maratha School” has visible European influence. This perhaps marks the reappearance of painting in Maharashtra after a very long time. We see emergence of wall art in places like Wai, Menavali, Motibag, and Satara. We further see the record of names of Maratha artists like Ragho, Tanhaji, Anuprao, and Mankoji. In the early 1800s, it seems that a “Maratha School” was well-established, however, it never reached the popular heights awarded to the Mughal, Deccan, Rajput, or Pahari schools. While painting as a pursuit and patronage did not find a significant expression in the Maratha context for a long time, it did come to the fore after the late-1700s. Perhaps it was too little, too late. Much later, however, some great artists have emerged from this region to make a significant mark in this space. Kulkarni, AR. Maharashtra in the Age of Shivaji: A Study in Economic History. 2nd ed. Pune: Diamond Publications, 2008. 18. Print. Apte, B. K. “Introduction.” Maratha Wall Paintings: Wai, Menavali, Satara, Pune. Bombay: Maharashtra State Board for Literature & Culture, 1988. Ix. Print. Chavan, Kamal. Maratha Murals: Late Medieval Painting of the Deccan, 1650-1850 A.D. Delhi: B.R. Pub. ;, 1983. 16. Print. Michell, George, and Mark Zebrowski. Architecture and Art of the Deccan Sultanates. New York: Cambridge UP, 1999. 248. Print. “Language and Literature in the Eighteenth Century.” The History and Culture of the Indian People: The Maratha Supremacy. Ed. R. C. Majumdar and V. G. Dighe. 3rd ed. Vol. VIII. Bombay: Bharatīya Vidya Bhavan, 1977. 666. Print.